1.) This is a game, and games are made to be fun. Please do not post any material which may offend others or disrupt the flow of the game. 2.) Communication over comm should be located within brackets [ ]. Out of character or OOC comments should be located within parentheses ( ). Telepathic communications, thoughts, emphasis, and starship names should be italicized. 3. Players are expected to post in-character at least once a week. If there is time needed off, please contact Joshawott, so he can place your character on a leave of absence. 4. Leave posts open-ended for someone else to easily reply to. This is the topic where members of Star Trek: Sovereign can post their character sheets. If you see a problem with another member's sheet, please contact that individual through PM. This topic should only be used for character sheets; general discussion should be confined to the "Haling Frequencies" thread. "He's not stern and cold; he's playful and lively." Off-Duty Clothing Taste: Pastel-colored tank tops and low-cut shorts, shoes that could be considered as Toms in modern times. 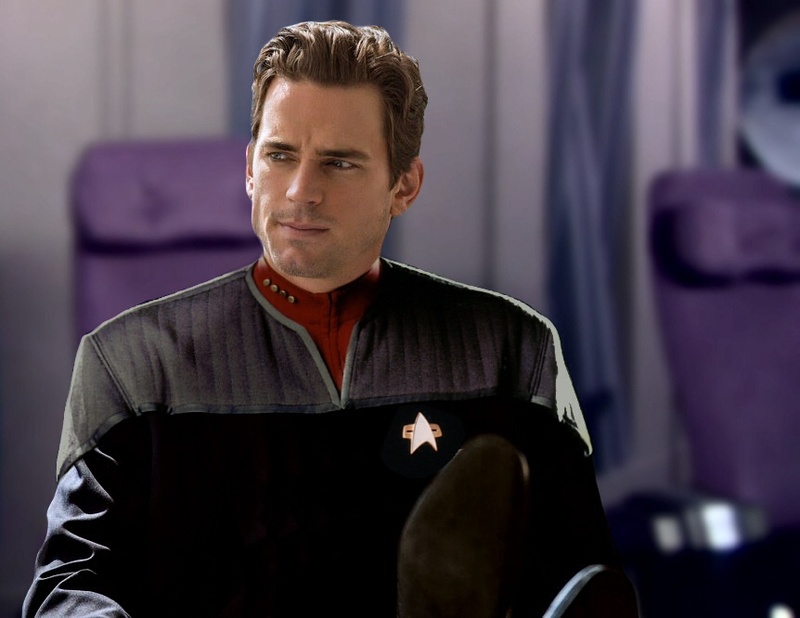 He tends to wear low-tech watches, sometimes with a small LCARS display for monitoring ships systems casually. Joshua in the Observation Lounge. Joshua crying in his ready room after a battle with the Jem'hadar. Joshua in his earlier years as a counselor. Captain Dawnter playing a holo-novel; Justice is Under Way, where he plays a detective always on the chase for a jewel thief. 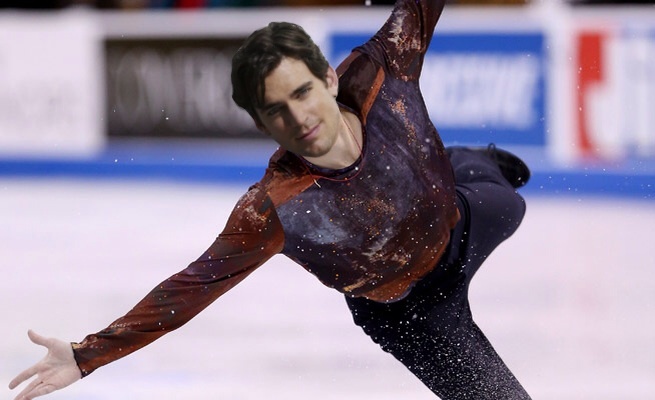 Joshua figure skating on the holodeck. Joshua on the holodeck boxing. Captain Dawnter about to go for a swim in the arboretum's swimming pond. Parent's Status: Married in Texas, working for a small space-travel agency. Personal History: Dawnter started his career as a forensic psychologist, which evolved sooner into his role as ship's counselor. His first post, on the Ursa Major, was in a small counseling room that he kept to himself, where he studied and brought in patients and suspects. He assisted the ship's counselor often, and it was he who got him promoted to lieutenant onboard the USS Comet, his first ship of exploration. At this point, there was no official counselor, and he remained in his forensic duties, allowing the informal role of therapist off-duty. He didn't spend much time relaxing until he was replaced with a junior officer; becoming the ship's first and only full-time counselor. On the Comet, he had risen twice in ranks, from lieutenant commander to commander. Upon his promotion to commander, he was appointed the role as first officer. His excellent judgement and show of character stood out to Riora Tlexl, who soon assembled her crew to test the brand new Sovereign-class. Joshua accepted the role as executive officer on the Sovereign, where he assisted Captain Tlexl in their ongoing mission of exploration. Joshua rose to the rank of captain as the Dominion War required the need of excellent commandants distributed quickly throughout task forces, and phenomenal flag officers to carry out paramount decisions. As his Betazoid commanding officer was offered a promotion to commodore, he took command of the first ship of its class at the ripe age of 36; there was no time to look for a replacement when he was an exceptional first officer. The Sovereign-class USS Sovereign NX-91001 had just lost its telepathic captain just a few weeks before the First Battle of Chin'toka. If the Sovereign hadn't been undergoing an emergency refit due to the extensive damage it took during previous altercations, it would most likely have been destroyed at the Battle of Betazed, a deployment Commodore Tlexl made as a prideful strike to cripple the Dominion. She later realized she was wrong for making such a decision, and regretted having thought in such a manner, apologizing to her former crew on behalf of there lives. After the War subsided, the Sovereign was assigned to its normal mission of peaceful exploration, particularly the regions neglected as a result of the War. Just a week before the Sovereign's assignment to the Beta Volvino system, Joshua's husband left him, a result of Joshua's tendency to make decisions without consulting in his partner. Andrew, an artist, was constantly being forced to move around his husband's schedule and living conditions. It was a peaceful seperation, but it hit Joshua very hard. He explains to his first officer after nearly falling apart in his ready room, "I don't think I loved anybody as much as I loved him. But I was stupid; I was selfish. I made a once loving and beautiful relationship into one-sided greed. It's my fault. I have the right to cry, just not in front of my crew." Hobbies & Past-Times: Figure skating and boxing. He's often called out on his odd combination of sports. Personality: Joshua dislikes acting as a superior, and sees himself as more a decision maker. He hates when he's seen as intimidating or having a sense of uppity. Achievements: Starfleet Medal of Valor, Figure Skating Gold Medalist for the Central America Region. Strengths: Physical prowess, natural empathy, open-mindedness. Weaknesses: Emotional sensitivity, lack of confidence, overwhelming curiosity. Voice: Tenor, Newfoundland Accent and idioms, often talks faster than he thinks and stumbles over his words or has to backtrack. Sometimes struggles to find the right words to express his thoughts. Off-Duty Clothing Taste: Leather jackets, jeans, t-shirts or golf shirts, sunglasses when appropriate. Distinguishing Features: Bright blue-green eyes and jet black hair. Personal History: Born on Luna, family moved to Earth (Newfoundland, Canada) when Mike was 4. A bit of a rebel and a scrapper in his teenage years, Mike often found himself in trouble with local law enforcement. 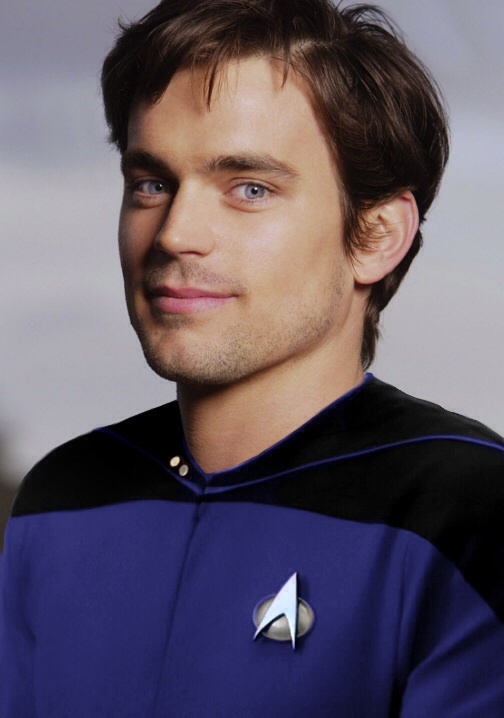 When he was 18, a family friend and Starfleet Officer who saw Mike's potential sponsored his enrollment into Starfleet Academy. Hobbies & Past-Times: Fishing (angling), rock climbing, mixed martial arts. Interested in old Terran firearms, automobiles and 2-d movies. Personality: Brash, hot-headed and impulsive. Difficulty respecting authority, mouthy and sarcastic, occasionally snappy/irritable. Can be devious/secretive. Flirts with just about every women he sees, but never in a vulgar way. Rarely pursues serious relationships. Passionate and caring, strong personal moral code. If you hurt his friends or family, expect retribution. Strengths: Quick thinker, adaptable. Capable hand-to-hand combatant. Able to sympathize with others. Weaknesses: Impulsive. Rebellious streak. Sarcastic tendencies. Off-Duty Clothing Taste: T-shirts, pants, etc. Parent's Status: Still living, retired college professors. Personal History: Born and raised in Phoenix, AZ to a German father and an Egyptian mother. Spent many years on research outposts and anthropological/archeological expeditions. Off-duty Clothing: T-shirts, jeans, etc. Distinguishing Features: Dark brown spots indigenous to his species that run from his forehead down to his toes. Personal History: From an early age, Gallen Tam, formerly known as Gallen Aelak, built things out of seemingly nothing. He would take apart appliances just to see how they'd work. When he admitted his self-replicating shower system in a school science fair, he was visited by a Joined Trill who wanted to admit him into an advanced learning academy for promising future hosts. He accepted the offer and immediately attended the boarding school, where he learned more about the small society of Trills who have the honor of hosting symbionts. He gained a newfound admiration for them and prayed that, one day, he would host one of his own. 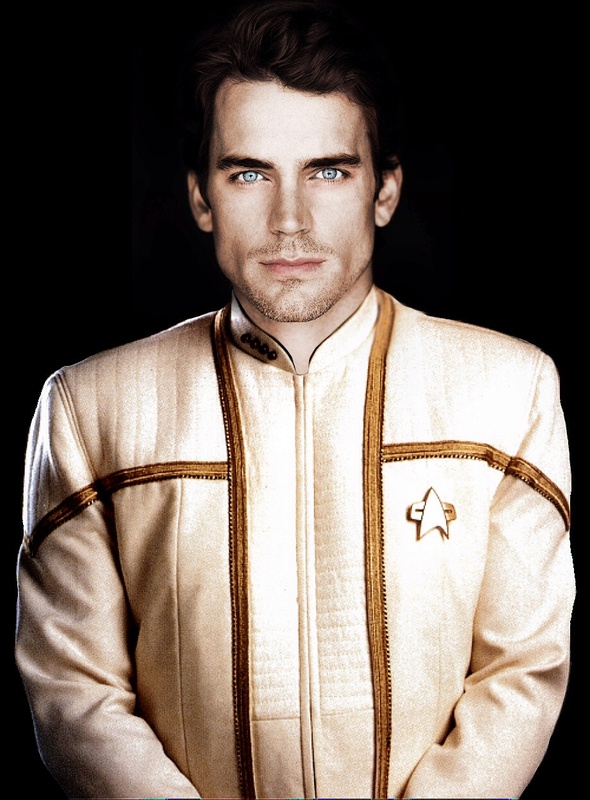 Upon enrolling into Starfleet Academy after graduating from the Symbiosis Institute, he became interested in starships and the systems that drove them. It was also at this time that he was offered to join with a symbiont. The Tam symbiont was nearing its eighth-hundredth birthday and it was very likely that Gallen would be its final host. Despite the consequences, he relished the opportunity and saw it as an even greater advantage in his studies. He would gain all of Tam's knowledge, but he wouldn't be passing any of his own accomplishments or history onto the next host. He wouldn't be remembered as much as the other hosts when he died, but he didn't mind having the memories of nine lifetimes in his head. In his second year as an Engineering cadet, he went home to Trill where he was joined to Tam. Returning to his studies on Earth, he acquired a new name and a new purpose. Personality: Unpredictable. Gallen's actions can be seen as erratic and sometimes questioned by his superiors. He doesn't make decisions in vain, but beleives that they are the right course of action. Achievements: Recognition by the Starfleet Corps of Engineers for enhancing the efficiency of antimatter and matter injector ports inside of a warp core assembly; The Charles Tucker Award for his work on the Sovereign Class Starship Development Project. Strengths: Nine lifetimes of knowledge and wisdom combined with his physical prowess and charm. Weaknesses: Hastiness. Gallen gets frustrated when tasks don't get done in a minimal amount of time. Personal History: Born on a lawless world, she grew up knowing hunger, violence and deprivation. Despite how bleak it was, her older brother would always find a way to make her smile; growing up he was her hero, and she did all she could to emulate him. Her mother scrimped and saved to try and buy passage off Grent. Her brother started working at twelve, so five year old Zaeryn was left home alone and quickly learned that she had to stay very quiet to avoid attracting unwanted attention. When she was eight, she witnessed her mother murdered in front of her eyes by a man who had broken into their home, looking for Zaeryn—who was forced to shoot the man in order to save herself (it was during this assault that she received the scar on her back). After her brother returned home and found her, he took everything they had and managed to get them away from Grent. He got them to a trading station, where he started working as a docker and was just able to afford sending her to school. As she studied, she quickly showed herself to be adept with technology, being fascinated at how things worked. For the next seven years, they got by, with his wage from the station and what she earned for fixing things for other residents. It was when she was fifteen the station was targeted by an Orion clan seeking to expand their sphere of influence, they launched a full scale assault on the trading station. In the chaos of the attack she was trapped onboard, but Kaeln wouldn’t evacuate without her, so when the Orions boarded the station they were both captured. In order to save her from a life of slavery and abuse, he agreed to join them. They kept their word for almost a whole year, before he was dragged onto a raider and she was left on the station—which was the last time she saw her brother. She was fitted (kicking and screaming) with a dataport and forced to be a “Net-Girl”, allowing others to delve into her mind for their own pleasure. She was subjugated to this depravity for over two years, but she was biding her time, learning all she could about how their controls and the dataport worked, so that when an opportunity arose to escape she was able to seize it and ran. She spent the next four years drifting, from planet to station to ship, never staying anywhere long, becoming more isolated every time she moved on—sometimes going for weeks without saying a word to another living being. Part of her secretly hoped to learn something about the fate of her brother and though she did hear Boslic/Orion men onboard Orion raiders and freighters, she was never able to substantiate if it was Kaeln or not. She learned to fend for herself, becoming something of a scrapper and more than capable of holding her own—even against far larger opponents. 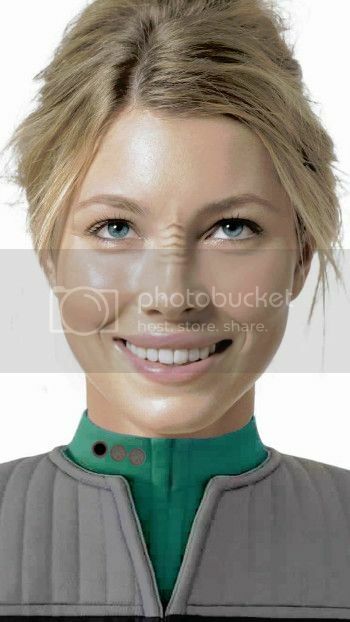 It was a chance encounter with a team of Starfleet engineers on the supply ship she was working aboard at the time, that ultimately led her down the path that saw her entering Starfleet. Since enrolling at the Academy, it hasn’t been a smooth ride. Independently minded, sullen, sarcastic and with a cynical view on life, she isn’t much of a ‘team player’. Though she scored well on course work, she also argued with instructors and classmates alike, having issues with the blinkered way they were expected to work. There were a few incidents that went on report, but nothing severe—at least nothing that saw her suspended or expelled. Upon graduating she was assigned to the Sabre-Class U.S.S. Shir’an as Ops Officer on gamma shift, but on the small ship her opinions and manner caused a lot of abrasion and disagreements with her superior, who had her transferred out after just six months. He had her dropped onto the U.S.S. Auriga, on an old Constellation-Class ship that was dragged out of mothballs during the Dominion War to act as supply ship. Seen as a dumping ground for the ‘undesirables’ of the fleet, she found the more lax attitude onboard more to her liking and she truly began to thrive. It wasn’t long before she stood out from most of the others crewmembers, given a position on the bridge and included on away missions, where her methodology could be put to good use. After two years, she was reassigned to the Copernicus-B, with a promotion to Lieutenant JG. It took her a while to get used to the more rigid and structured nature of the ship, but with a proven track record on the Auriga she was given a little wiggle room and offered a chance to shine. Over the two years she served onboard, she proved to be a valued member of the surveyor’s crew. From here she was promoted to Lieutenant and transferred to the U.S.S. Red Cloud, where she served as Chief Operations Officer. Personality: She is a somewhat stoic woman, not liking to give away anything about herself whenever possible—with her sharp sarcasm being a defence mechanism to keep others at arm’s length. Though she prefers solitude, she also finds herself to be lonely, missing the closeness she once shared with her brother—his fate is something that still gnaws at her, though being a realist she knows that she may never find out what happened to him. Her life outside of ‘civilised society’ has shown her just how dark and horrific things really are, part of the reason she distrusts the ‘sunny’ Federation outlook. She may not have much in the way of friends (she could probably count them on one hand), but those that she is close to she would fight tooth and nail for. Achievements: Surviving her so-called childhood is a big personal win for her. Though her work has gotten praise from shipmates, there aren’t many medals pinned to her chest for it. Strengths: Surprising strong and fast, she is a fierce fighter—not to be underestimated despite her stature. A quick-thinking problem solver, her solutions may not always be Starfleet sanctioned but they are generally effective. Significant psychological fortitude—not much will rattle her. Computer expertise, partly thanks to the dataport there aren’t many security systems she can’t find her away through or around. Weaknesses: Argumentative and adversarial—a defence mechanism to keep herself isolated. Not a great team player and has issues with authority. She likes to do things her own way, not always abiding by Starfleet operating guidelines. Finds it difficult to trust or get close to others. Voice: Kala's voice is smooth,formal, calm, clear, intelligent, brief, and direct. Off-Duty Clothing Taste: Anything elegant. sundresses, heels, and on occasion cowgirl boots. Ramak Kala is a product of the Cardassian Occupation. She fought her entire childhood to free Bajor and return the planet to its people. At the age of 9, Kala lost her mother to a Cardassian overseer who reduced Ramak Kendra to a smudge on the wall with his disrupter. Kala vowed to join one of the resistance cells and fight for freedom. The death of her mother was just the push she needed. By the age of 19, Kala had advanced the ranks of the resistance cell and fought her way into infantry status, however, somewhere along the line she realized that the resistance was sacrificing alot of good people to accomplish its goal. So, she slowed her pace and became a intern with one of the cell's medics. Alenis Etilen, the "Medic", taught her everything he knew. Several years later he was killed during a raid on Galor outpost. Kala took her mentor's death pretty hard, but she kept fighting the good fight. Again, she excelled in her position as the new medic and maintained close ties to the fight for Bajor. As the occupation came to a close and the Bajoran people formally requested to join the Federation, Kala began to learn more and more about her respective field. Ramak Kala requested to join the Federation at the age of 24. She was accepted and graduated second in her class, with focuses on Biological and Physical sciences. Kala minored in Genetics, Microbiology, and Molecular Biology. Academy Minors: Genetics, Microbiology, Molecular Biology, and battle field medicine. Personality: Assertive and outspoken - driven to lead. Excellent ability to understand difficult organizational problems and create solid solutions. Intelligent and well-informed, usually excels at public speaking. Values knowledge and competence, and usually has little patience with inefficiency or disorganization. Strengths: Ramak Kala is well trained and experienced in the fields of Medicine and Combat. She is outspoken, diplomatic, intelligent, and efficient. Weaknesses: Kala is blunt, contemptuous, stubborn, arrogant, hard, and strict. Off-Duty Clothing Taste: Cultured Pearl Necklace,Ankle Zip Legging Jeans,Ludlow Shirt, Scarves, Handbags, and a variety of heels. Distinguishing Features: antennae on the top of her head, blue skin and white or silver hair, elaborate hair styles. Personal History: Tallia Yaren spent most of her childhood moving from one outpost to another. Given her parents' demanding jobs Tallia was often split between the two. One year she may have lived with her father and the next with her mother. Sufficed to say, Yaren grew up not knowing the benefits of a stable home. At the age of twelve Yaren's father became a diplomatic ambassador to the Federation and was offered a seat on the counsel;he accepted. Tallia was then separated from her mother for the six years that followed. During that time, Yaren was taught the values of human. She studied on Earth as a diplomatic guest, with all the perks there-in. 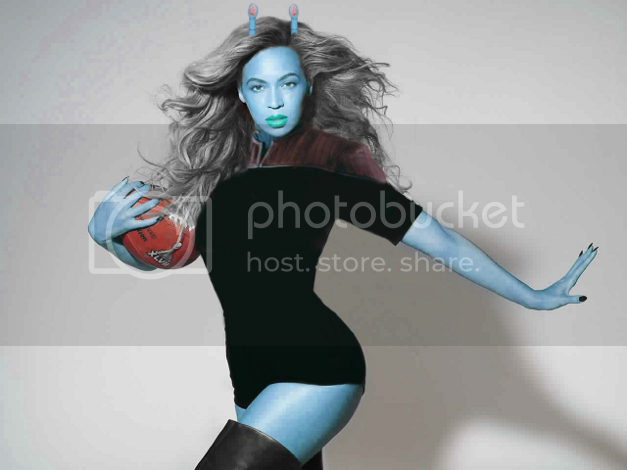 However, as an Andorian, Yaren began to linger toward a more militaristic education along with several art schools. Upon her graduation of high school Tallia had earned several honors in tactics, weaponry, hand to hand combat, and cover operations. Tallia had also mastered the piano, trumpet, organ, and the flute. Yaren graduated with honors- salutatorian of her class, and a recommended ride to the academy. She declined. Tallia Yaren returned to Andoria in search of her mother. To her amazement their old home had been destroyed and replaced. SCO Tara Yaren had devoted her life to living in space. When Yaren's father took a position on Earth there was no need for a dwelling on Andoria. Tallia spent several months on a fleet flag ship under her mother. She even enlisted in the Imperial Guard, but her plans changed when her adoptive family, on Earth, had experience a tragedy. She returned and enlisted in the Federation. With her father's help she was able to learn all the material relevant to an officer. Yaren again graduated top of her class- Valedictorian. Academy Majors: Linguistics, Tactical Advancement, and applied Physics. Personality:Serious and quiet, interested in security and peaceful living. Extremely thorough, responsible, and dependable. Well-developed powers of concentration. Usually interested in supporting and promoting traditions and establishments. Well-organized and hard working, works steadily towards identified goals; can usually accomplish any task once she's set her mind to. Loyal and faithful. Extremely well-developed senses, aesthetic appreciation for beauty. Flexible and open-minded. Likely to be original and creative. Enjoys the present moment. Has very high standards for her performance, and the performance of others. Natural leaders, but will follow if she trust existing leaders. Strengths: Yaren is a natural born leader. She's always astute and adaptive. Weaknesses: Yaren is often quite and reserved when she needs to open up to others about emotional issues.